Himachal Pradesh is still one of those states of India which hasn't lost all of its culture, food habits and traditions. Most Himachali's still prefer to have traditional Himachali food and celebrate functions, marriages the traditional Himachali way. Himachali cuisine has its own uniqueness of taste, way of preparation, way of serving, use of spices. Most of these dishes have local ingredients and vegetables. For example Dhaam still has its own style of preparation, serving and traditional menu. Here is one such unique recipe from Himachal and it is called Bhaturu or Bhatooru. Don't confuse it with Punjabi Bhatura (of famous Chole bhature) which normally has Maida (purpose flour) as main ingredient. 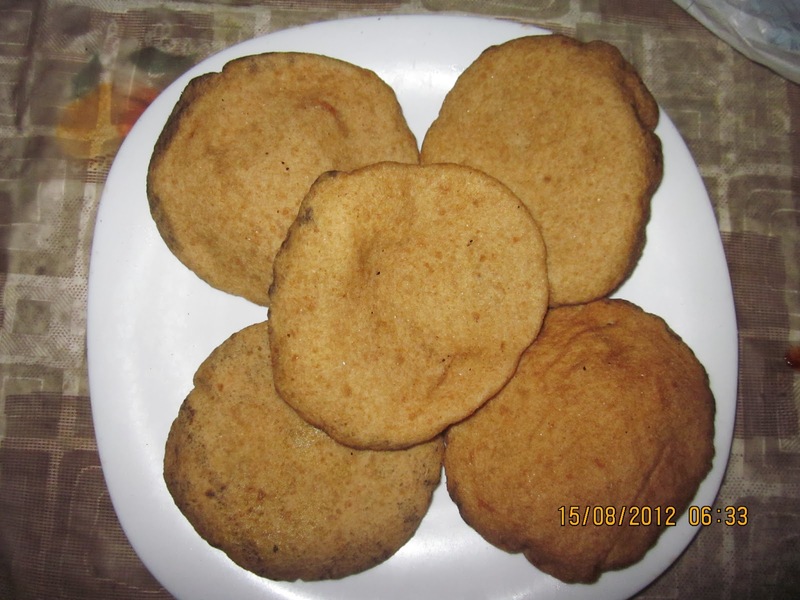 Bhaturu or Bhatooru is a kind of bread (Roti) which is cooked by fermenting wheat flour. Mix wheat flour and water along with Malera/Khameer (40-50 grams should suffice for 1/2 Kg of flour). In case you don't have Malera/Khameer, you can buy yeast powder from shop and use that. Mix and knead it well to turn into dough. Leave this dough for fermentation for next 4-5 hours. In winters or places with low temperature it can take 7-8 hours for fermentation. In winters you should wrap the dough with some thick blanket/bedsheet so that temperature (25-30°C) is maintained and fermentation doesn't take long. Bhaturu's are relished baked as well as fried. Since it's been part of staple food in most parts of Himachal, mostly it is baked on tawa/pan. For special occasions like festivals, marriages bhaturu's are deep fried in oil. From dough make small even balls of the same size. For ages people of Himachal have been shaping these small dough balls into Roti with hands, but you can use a board and rolling pin to shape them as Roti's. Bhaturu shouldn't be thin like normal chapati/phulka. The thickness of Bhaturu should be around 0.5 to 1cm. Leave these Roti's for next 10-15 minutes wrapped under a cloth. After 15-20 minutes either you can bake these or deep fry them in oil. For baking put the raw Bhaturu on hot pan/tawa. When it is baked on both sides, put it directly on gas burner or fire to have that soft and puffy Bhaturu's. Serve them hot with seasonal vegetables, daal or curry. Bhaturu's are best when baked in earthen oven (Chulha). Bhaturu's also has a variation known as bharwan Bahturu (stuffed bread). Before baking, the dough balls are stuffed with a grounded mixture of soaked daal,rice etc. You can even use boiled potatoes to stuff them. Bhaturu is known as Suhaalu or Sumkeshi roti in other parts of Himachal Pradesh. Mix all ingredients in a bowl. Stir it well for sometime and keep in an airtight container. The Malera (yeast) will be ready to use. Refrigerate this and should be good for use for next 4-5 weeks. A study at CSIR by Savitri and TN Bhalla has found that traditional fermentation adds quality to Bhatooru by way of enhancing their protein content, vitamin and essential amino acids. Study also shows that Bhaturu has better nutritional value as compared to chapatti/roti prepared from non-fermented dough.